Language localization is the process of adapting a product that has been previously translated into multiple languages to a specific country or region (from Latin locus (place) and the English term locale, “a place where something happens or is set”). 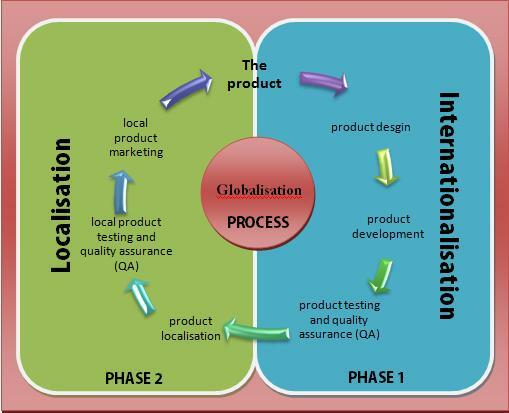 It is the second phase of a larger process of product translation and cultural adaptation (for specific countries, regions or groups) to account for differences in distinct markets, a process known as internationalization and localization. Language localization differs from translation activity because it involves a comprehensive study of the target culture in order to correctly adapt the product to local needs. Localization can be referred to by the meronym L10N (as in: “L”, followed by ten more letters, and then “N”). The localization process is most generally related to the cultural adaptation and translation of software, video games and websites, as well as audio/voiceover, video or other multimedia content, and less frequently to any written translation (which may also involve cultural adaptation processes). Localization can be done for regions or countries where people speak different languages or where the same language is spoken: for instance, different dialects of Spanish, with different idioms, are spoken in Spain and in Latin American countries. The former Localization Industry Standards Association (LISA) said that globalization “can best be thought of as a cycle rather than a single process”. To globalize is to plan the design and development methods for a product in advance, keeping in mind a multicultural audience, in order to avoid increased costs and quality problems, save time, and smooth the localizing effort for each region or country. Localization is an integral part of the overall process called globalization. There are two primary technical processes that comprise globalization: internationalization and localization. The first phase, internationalization, encompasses the planning and preparation stages for a product that is built by design to support global markets. This process removes all cultural assumptions, and any country- or language-specific content is stored so that it can be easily adapted. If this content is not separated during this phase, it must be fixed during localization, adding time and expense to the project. In extreme cases, products that were not internationalized may not be localizable. The second phase, localization, refers to the actual adaptation of the product for a specific market. The localization phase involves, among other things, the four issues LISA describes as linguistic, physical, business and cultural and technical issues. At the end of each phase, testing (including quality assurance) is performed to ensure that the product works properly and meets the client’s quality expectations. Though it is sometimes difficult to draw the limits between translation and localization, in general localization addresses significant, non-textual components of products or services. In addition to translation (and, therefore, grammar and spelling issues that vary from place to place where the same language is spoken), the localization process might include adapting graphics; adopting local currencies; using proper format for date and time, addresses, and phone numbers applicable to the location; the choices of colors; and many other details, including rethinking the physical structure of a product. All these changes aim to recognize local sensitivities, avoid conflict with local culture, customs, common habits, and enter the local market by merging into its needs and desires. For example, localization aims to offer country-specific websites of the same company or different editions of a book depending on where it is published. Whereas localization is the process of adapting one product to a particular locale, globalization designs the product to minimize the extra work required for each localization. Suppose someone is working for a company that, until now, has operated exclusively in the United States. However, the company is now opening a major office in China and needs a Chinese-language website. The company offers the same products and services in both countries with only some minor differences, but perhaps some of the elements that appeared in the original website targeted at the United States are offensive or upsetting in China (use of flags, colors, nationalistic images, songs, etc.). Thus, that company might lose a potential market because of small details of presentation. Furthermore, this company might need to adapt the product to its new buyers; video games are the best example. Now, suppose instead that this company has major offices in a dozen countries and needs a specifically designed website in each of these countries. Before deciding how to localize the website and the products offered in any given country, a professional in the area might advise the company to create an overall strategy: to globalize the way the organization does business. The company might want to design a framework to codify and support this global strategy. The globalization strategy and the globalization framework would provide uniform guidance for the twelve separate localization efforts. Globalization is especially important in mitigating extra work involved in the long-term cycle of localization. Because localization is a cycle and not a one-time project, there will always be new texts, updates, and projects to localize. For example, as the original website is updated over time, each of the localized websites already translated will also need to be updated. This cycle of work is continuous as long as the original project continues to evolve. It is therefore important for globalization processes to be created and streamlined in order to implement ongoing changes. Language codes are closely related to the localizing process because they indicate the locales involved in the translation and adaptation of the product. They are used in various contexts; for example, they might be informally used in a document published by the European Union or they might be introduced in HTML element under the lang attribute. In the case of the European Union style guide, the language codes are based on the ISO 639-1 alpha-2 code; in HTML, the language tags are generally defined within the Internet Engineering Task Force’s Best Current Practice (BCP) 47. The decision to use one type of code or tag versus another depends upon the nature of the project and any requirements set out for the localization specialist. Most frequently, there is a primary sub-code that identifies the language (e.g., “en”), and an optional sub-code in capital letters that specifies the national variety (e.g., “GB” or “US” according to ISO 3166-2). The sub-codes are typically linked with a hyphen, though in some contexts it’s necessary to substitute this with an underscore. There are multiple language tag systems available for language codification. For example, the International Organization for Standardization (ISO) specifies both two- and three-letter codes to represent languages in standards ISO 639-1 and ISO 639-2, respectively.